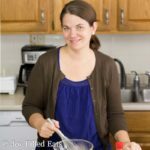 You are here: Home / Desserts / Cakes & Cupcakes / Ricotta Cheesecake – Low Carb, Keto, 8 Ingredients! 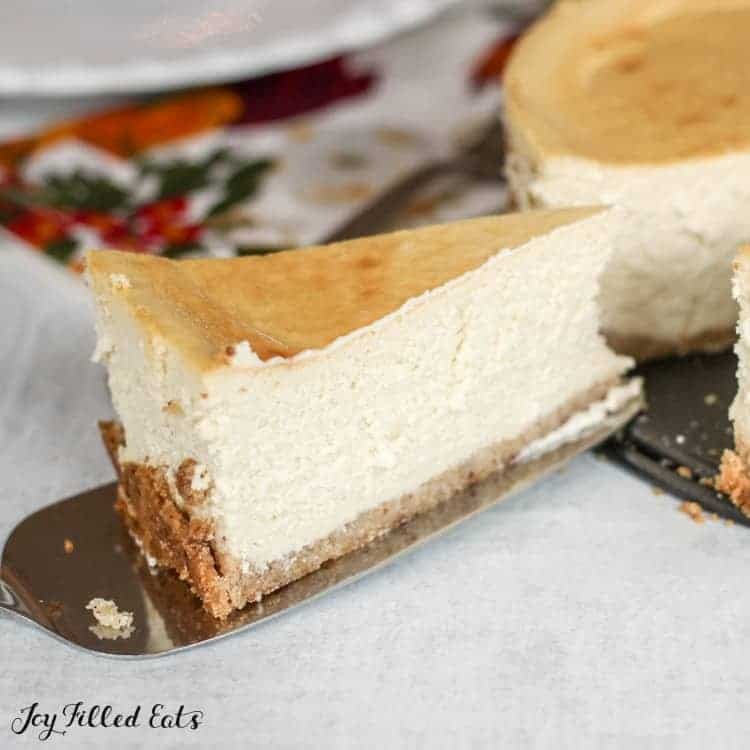 Ricotta Cheesecake – Low Carb, Keto, 8 Ingredients! This Vanilla Ricotta Cheesecake Recipe is rich and creamy. If you’ve never tried ricotta in a cheesecake it works really well. It makes a lighter cheesecake than just using cream cheese. 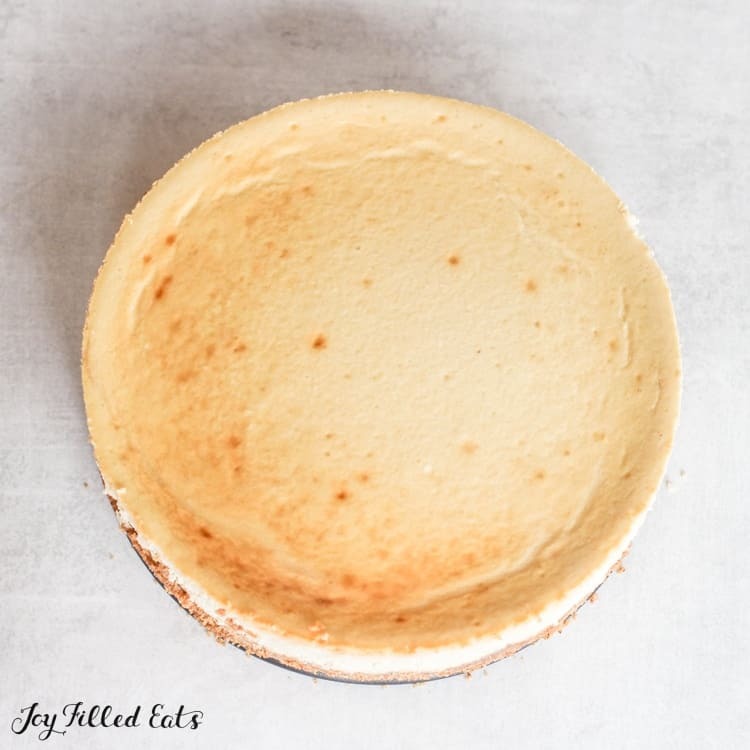 With just 8 simple ingredients I’m sure this will be your new favorite keto cheesecake! Almost every year my husband and I host a cheese tasting party for our friends. It is one of my favorite nights of the year. We provide wine, crackers, fruits, and dessert and each couple brings an interesting variety of cheese. We also do a white elephant gift exchange with humorous gifts. What is the best type of dessert for a cheese party? Cheesecake, of course. So I decided to stick with the theme and make a ricotta cheesecake for dessert. When presented with multiple cheesecake flavors I tend to stick to the classics. Vanilla. Lemon. Maybe Raspberry. Plain old New York Style Cheesecake topped with fresh strawberries. I don’t often go for chocolate, caramel, peanut butter, or other intense flavors when eating cheesecake. I love all of those but like my cheesecake simple most of the time. The vanilla flavor is the star in this cheesecake. It is perfect on its own or topped with a top of whipped cream and the fresh berries of your choice. 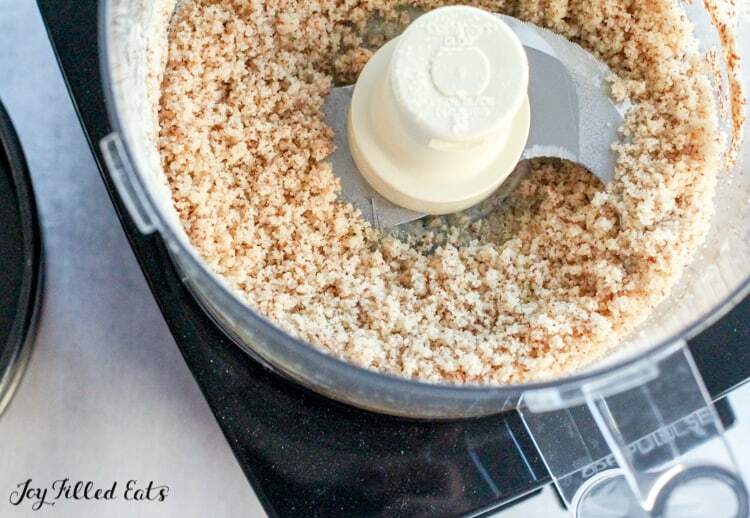 I make a very simple almond flour crust for this ricotta cheesecake in my food processor. It only takes a minute or two to pulse the ingredients and then press them into the bottom of a springform pan. 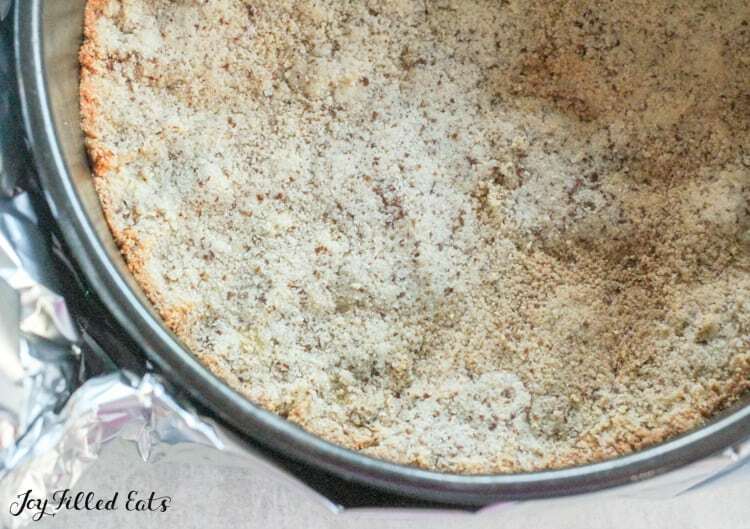 Using unblanched almond flour gives an appearance similar to a traditional graham cracker crust. Once you press the crust into the bottom of a springform pan you bake it until it is golden while you make the cheesecake filling. Prebaking the crust brings out the flavor from the almond flour and gives it a nice golden hue. It also helps prevent the crust from getting soggy from the ricotta filling. 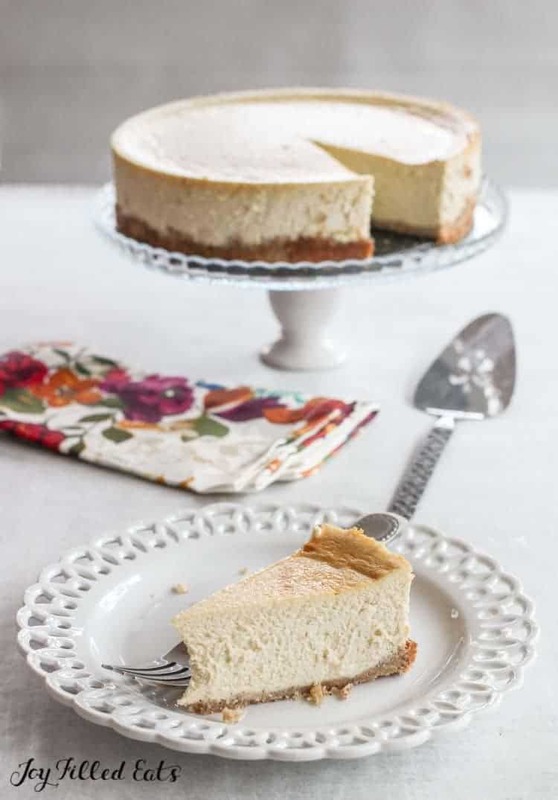 Using ricotta in cheesecake gives the cheesecake a lighter texture than a dense New York cheesecake and has a mild enough flavor you can add in any flavor of your choice. 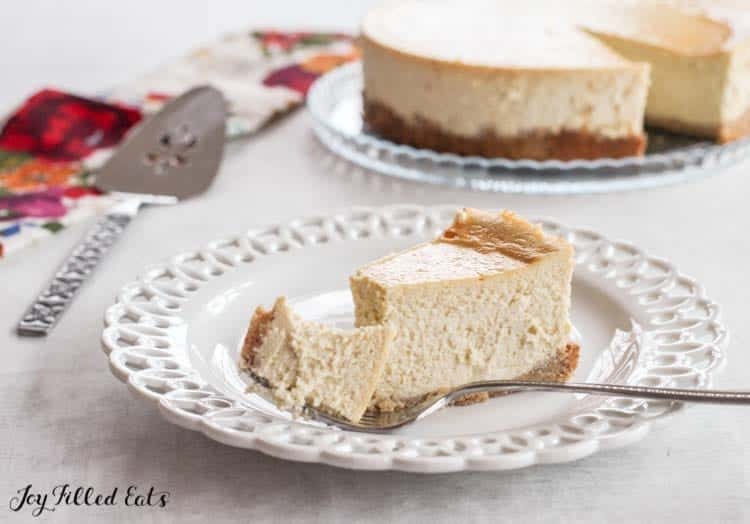 I used vanilla extract is this ricotta cheesecake so the flavors of the ricotta and cream cheese would really stand out. You can sub in lemon, orange, or almond extract instead. Another idea would be to swirl in a berry puree before baking. I love the beautiful colors of cranberry swirl cheesecake or my raspberry cheesecake brownies. My top kitchen appliance is a food processor. You see my Cuisinart food processor in almost every recipe I have. If you are only going to buy one appliance to prep with this should be it. I recently upgraded to the 14 cup model and it is like a dream come true. I gave my ten year old smaller food processor to a friend because it is still going strong. When you make cheesecake in the food processor it saves on time because you can make the crust and then the filling without even washing it. True story. I don’t even bother to wash the bowl between steps. A couple bits of almond flour crust in the cheesecake batter doesn’t matter in the slightest. I just scrape out the sides with a rubber spatula and let the crumbs remain. what is a Bain Marie? Do I need a water bath for cheesecake? The term Bain-marie means “A container holding hot water into which a pan is placed for slow cooking”. The reason why a water bath works so well for cheesecake is that it helps the cheesecake heat up and then cool down gradually. 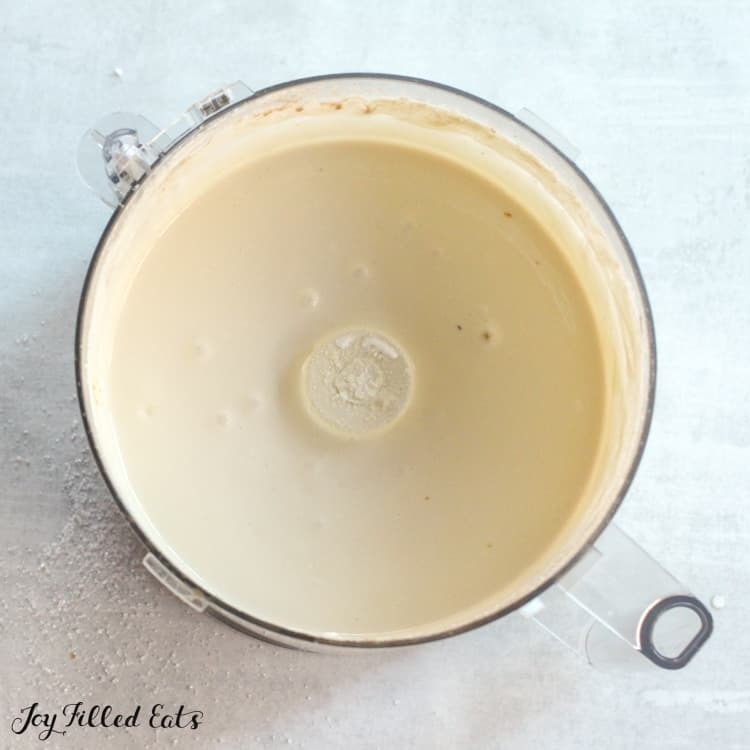 This ensures a creamy texture and helps prevent cracking. I don’t always use a water bath. And I’m not always patient enough (or have enough time) to let my cheesecake cool gradually. So sometimes my cheesecakes crack. When that happens I simply top them with berries or whipped cream and no one is any wiser. Check out my beautiful cracked easy pumpkin cheesecake. Still delicious! What if I don’t have a springform pan? You can make any cheesecake into cheesecake bars. For this one, I would make 1.5 times the crust and then bake it in a 9 x 13 pan. It will take between 35-45 minutes to bake. Maybe a little longer. Just bake it until the center only jiggles slightly when gently shaken. I hope you love this Ricotta Cheesecake! This Vanilla Ricotta Cheesecake is rich and creamy. If you've never tried ricotta in a cheesecake it works really well. It makes a lighter cheesecake than just using cream cheese. The vanilla flavor is the star in this cheesecake. Preheat oven to 350. Wrap a springform pan with three layers of aluminum foil. You are going to bake this is a water bath so this protects the crust from getting wet. Mix crust ingredients until crumbly. Press into the bottom of the springform pan. Bake for 12 minutes until golden brown around the edges. Meanwhile, in a food processor or with an electric mixer mix the ricotta cheese until smooth. Add the cream cheese and mix again until combined. Add the eggs, vanilla, and sweetener. Process until smooth. You will probably need to scrape down the sides of the bowl a few times. When the crust is done grease the sides of the pan with a pat of butter on a fork. Don't touch it to the crust. This will help the cheesecake release from the pan easier. Pour the cheese mixture on top of the crust. Put the entire pan into a larger pan. Pour hot water into the larger, outside pan. 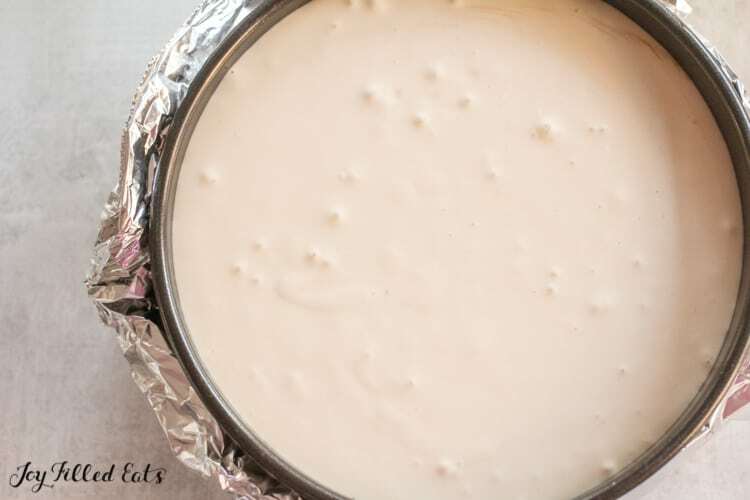 Bake at 350 for 1 hour 10 minutes or until only the very center of the cheesecake jiggles. Leave the cheesecake in the oven with the oven off for at least one hour. Preferable two hours. Refrigerate for at least 4 hours before serving. To serve run a knife around the edges of the pan and then release the spring mechanism to remove the outside of the pan. Originally Published February 22, 2016. Revised and Republished January 9, 2019. Can sugar be used instead of sweetness, and how much? Twice as much. I have not tested this recipe with sugar but it should work. Hi I have always made ricotta cheesecake without any cream cheese, any thoughts on whether this would work with the low carb recipe? How much extra ricotta would I need? I think it would work. You would just need to add extra ricotta to replace the cream cheese. The same amount of oz should be fine. Yes. It will bake for about the same time. Maybe 5 minutes less. Wonderful recipe. My cheescake came out perfect. No cracks. I never thought of using the food processor, fantastic idea. Thank you. My cheesecake was horribly over done. Even though I cooked it for 10 minutes left then directed. I think leaving it in the oven made it even more over done, a shame that I lost 1/3 of it due to overcooking. Have you checked your oven temperature recently? It should not burn with this method. Your oven temp might be off. Or did you use a bigger pan? That would result in a thinner cheesecake that cooks faster than directed. Thanks, Taryn! Another winner! I made this for our Valentine's Day dessert and all enjoyed it. I think I've made one other baked cheesecake, back in the dark ages, lol! This was so simple and turned out beautiful. I don't know that I'll mess with the water bath next time, but it did look like the real deal. This is the best cheesecake I’ve had in years. Absolutely light, yet full of richness. 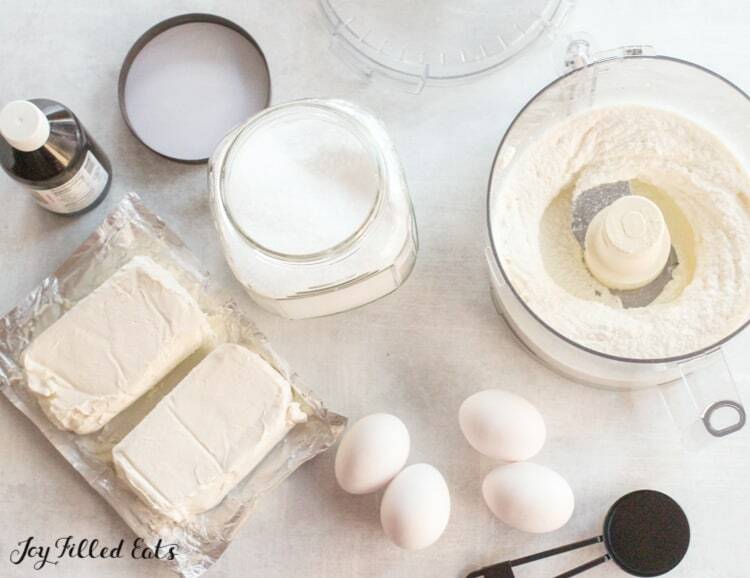 Love ricotta anyway, but this super easy recipe will be the only one I make from now on. I added small amount (1/2 cup) of Lilly’s sugar free chocolate chips to filling and even though they fell to bottom still a delicious addition. Very wonderful and I would serve to anyone, not just to low carvers. Thanks for sharing this fantastic recipe! A dear woman in my church introduced me to Wilton's baking strips. I bought mine at our local Ace Hardware. You soak them, ring them and then they fasten around your spring pan. They work wonderfully on cheesecakes as well as making any cake bake evenly without a sever dome. They are great and no more water baths! My top I would call slightly tan def not burnt and its amazing. I went with a Vanilla Chai flavor and mixed my sweetners and added slightly less than the recipe called for. Again I think it came out amazing and I am refraining from eating it all. Thank You! Why does the top burn???? Did you have your cheesecake on the top rack? The top should not burn. Mine never has. I always bake it on a low rack. I can add that to the directions. Is there a way to do this not in a water bath? I don't have anything big enough for my pan to fit inside of. You don't have to use the water bath but it helps the cheesecake cook evenly. I would recommend putting a pan of hot water on the shelf below the cheesecake so that the air in the oven is moist. Thanks for the recipe! What size springform pan did you use? Just a standard pan. I think it's 9 inches. Could this be made in an Instant Pot? And if so, for how long? 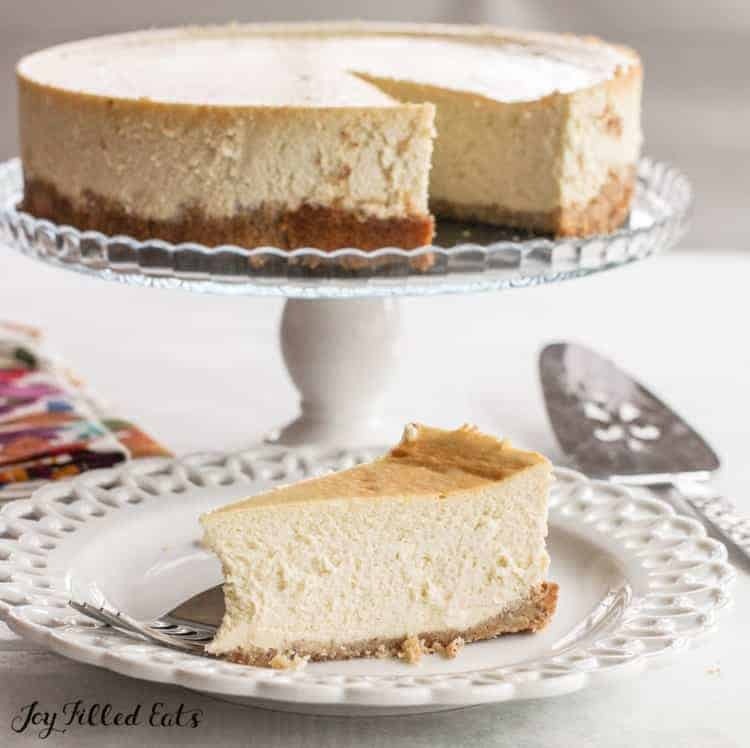 You would have to half the ingredients for a smaller pan and look up cooking times for an instant pot cheesecake. I haven't made one yet. Can you replace the vanilla with maple, almond or caramel extract? Yes. I would start with half the amount and then taste the batter. Different extracts can have different strengths. what size are the packages of cream cheese? Can the whole cheesecake be frozen? I have not tried but I think so. Just thaw before serving. Hi Taryn, Do you have a recipe for a no bake crustless cheesecake using stevia only? No, sorry. I'm not a fan of stevia on it's own. It tastes bitter to me. You could just blend cream cheese with a but of heavy cream and sweeten to taste. Hi Taryn, I'm wanting to make this in a few days and was wondering if the baking blend could be replaced with the THM baking blend or would that not work?